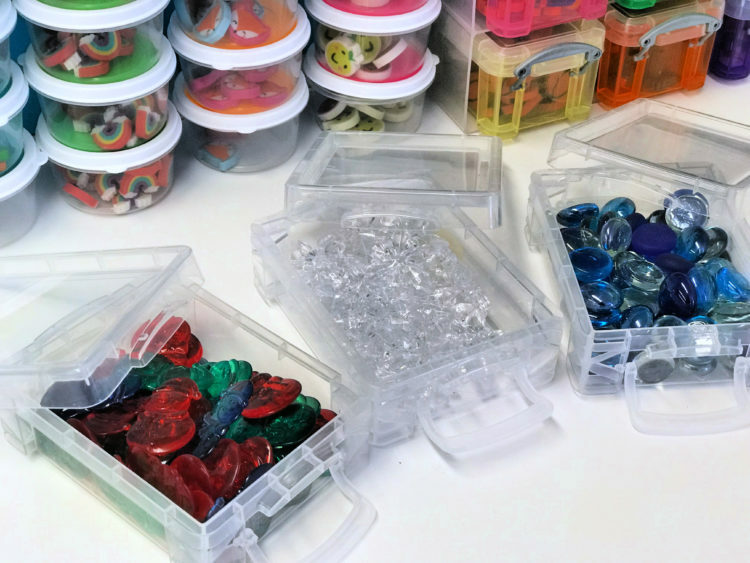 This is going to sound totally weird, but one of the earliest memories I have of a favorite activity when I was little, is sitting at a big table with a jar full of buttons. I would sort them, count them, make them into patterns . . . 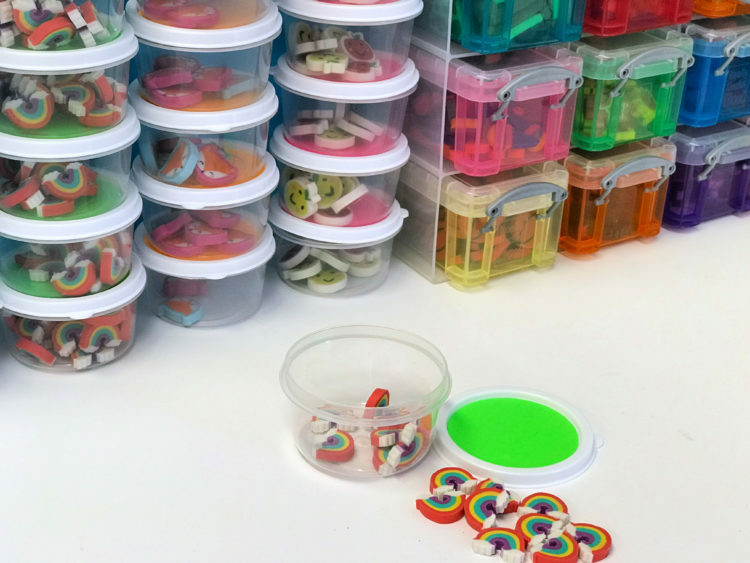 I literally spent HOURS playing with a jar of buttons. Perhaps that’s why I love counting cups for my students. They’re simple, engaging and there are so many skills that can be practiced while your students think they are . . . dare I say it . . . playing. 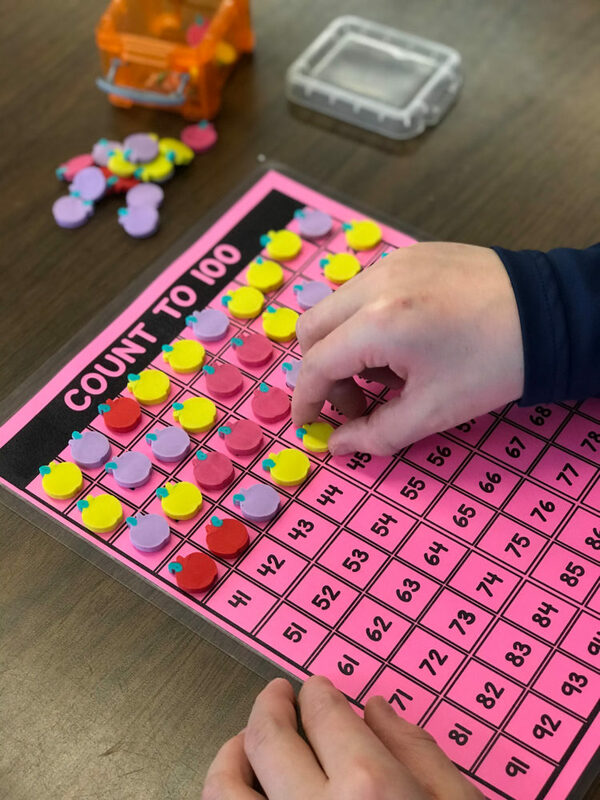 I know that for many teachers the logistics of hands-on math at such a young age can be a nightmare and rightfully so. With the make up of our classrooms, the sheer number of students and the demands placed on them, there is that fear that by offering activities that allow students some form of freedom to explore, there will be chaos and confusion. 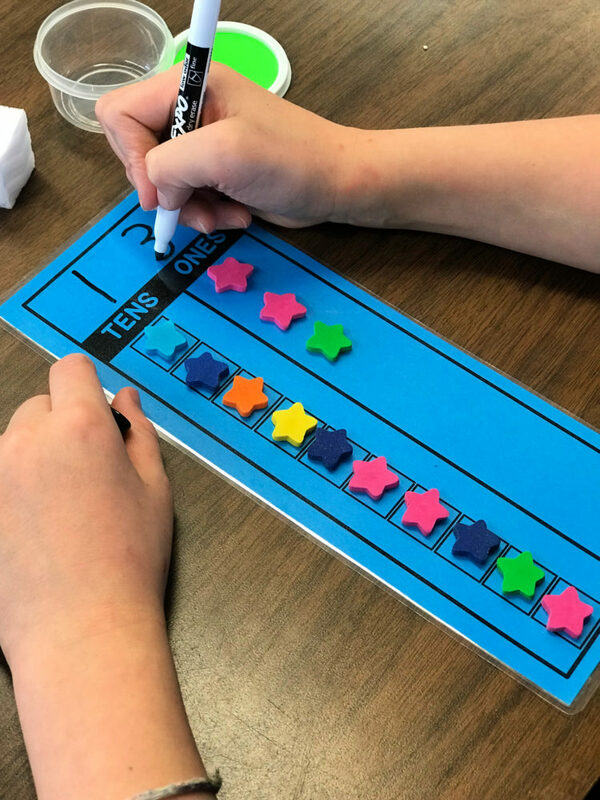 However, I promise you with a little bit of planning and a lot of modeling, you will find that students are more engaged and more apt to stay on task. 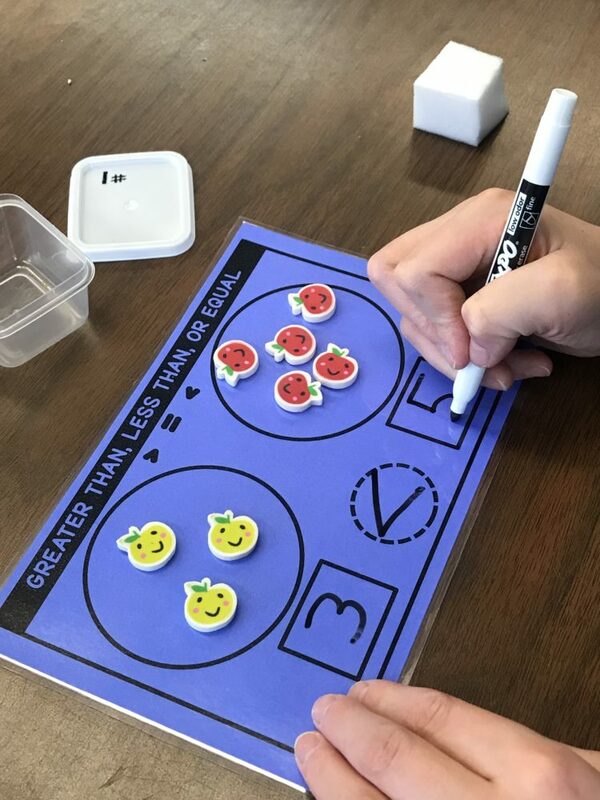 Math will become real with items they can touch and manipulate, and soon because your students love math, you will too. 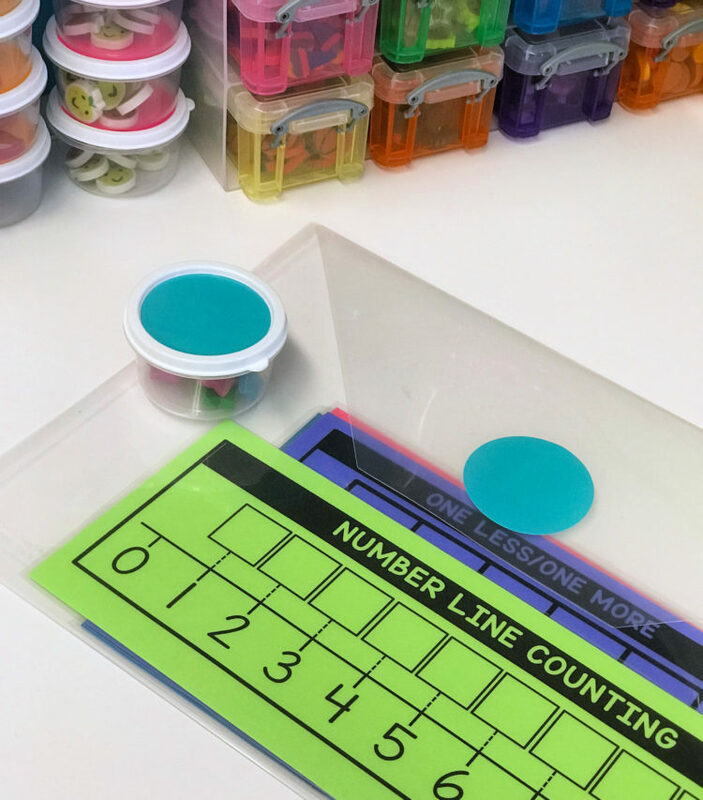 Counting cups will offer your students that sense of play and give them hands-on practice with skills they need . . . It’s also super easy to differentiate them to pinpoint specific skills and . . . best of all . . . they are inexpensive to use. But this is only one part of the day and only one place where counting cups show up in my classroom. 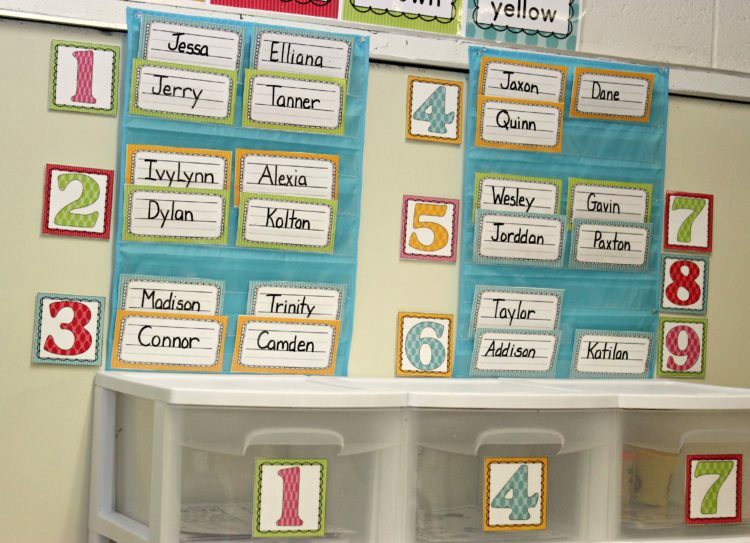 Let me tell you a little bit more and maybe you can see yourself using them in your own class. They’re cute and all that, but what’s the purpose? 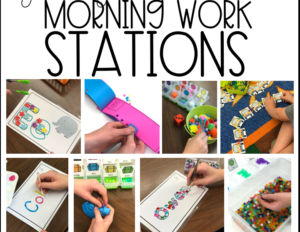 The purpose is hands-on sorting, counting, adding, comparing and manipulating. 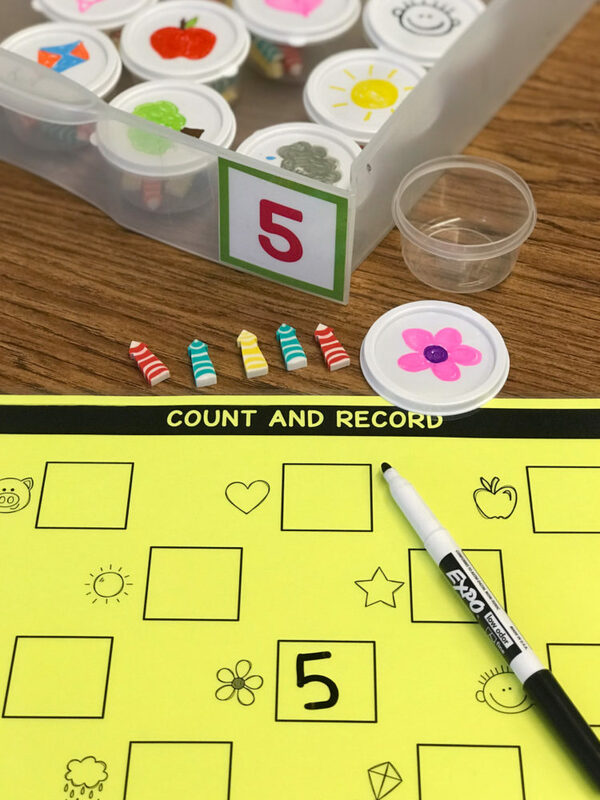 So much of what we expect kids to accomplish with pencil and paper can be done with simple little cups and a handful of items. Grab a cup and count . 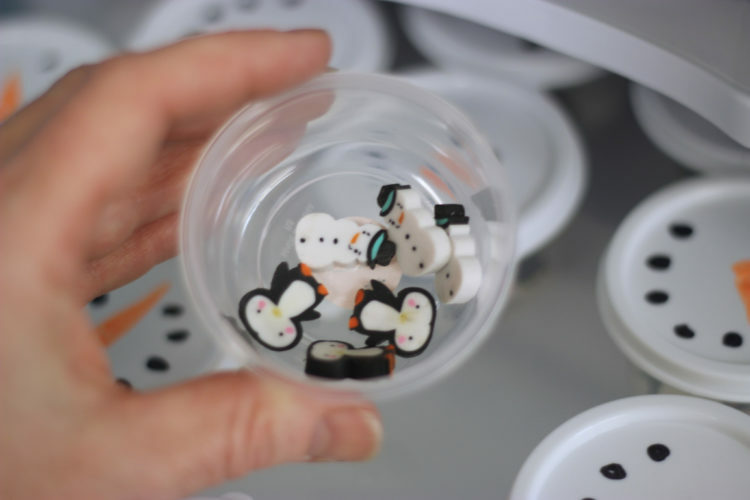 . .
Whatever skill you happen to need them to practice, you can accomplish with these little cups. 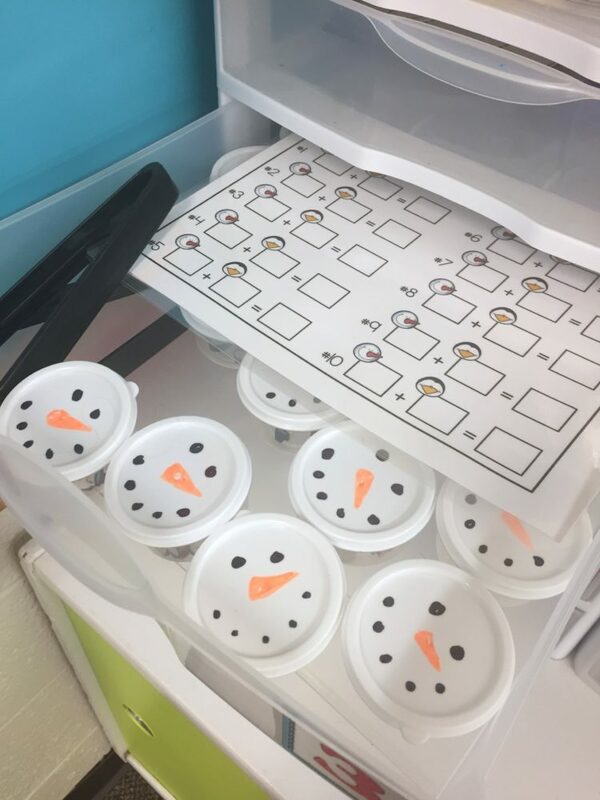 but these cups are also great for interventions, activities for volunteers working with students in your classroom and early finishers. 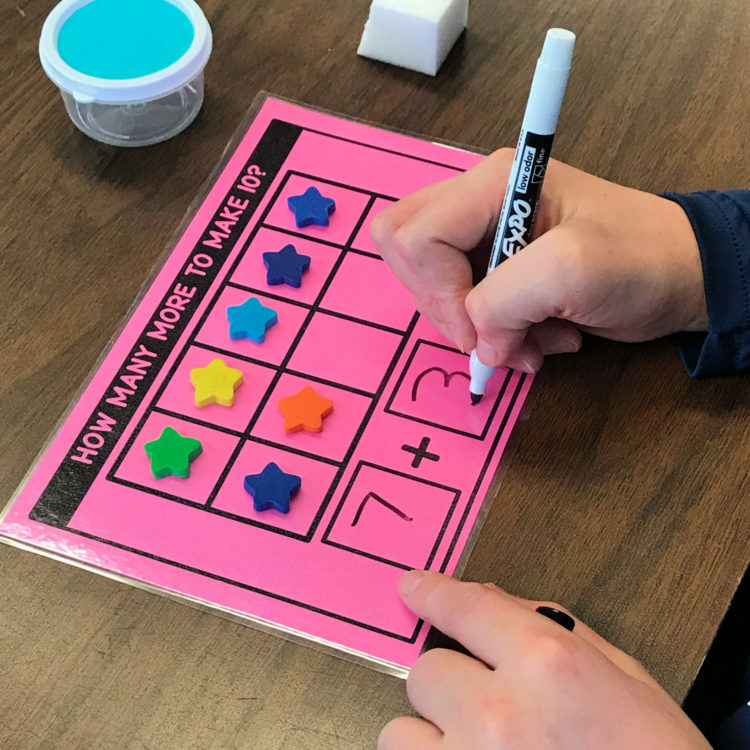 I like to give my students the option to grab a cup and math mat and work on skills that they are trying to master whenever we have a free moment. 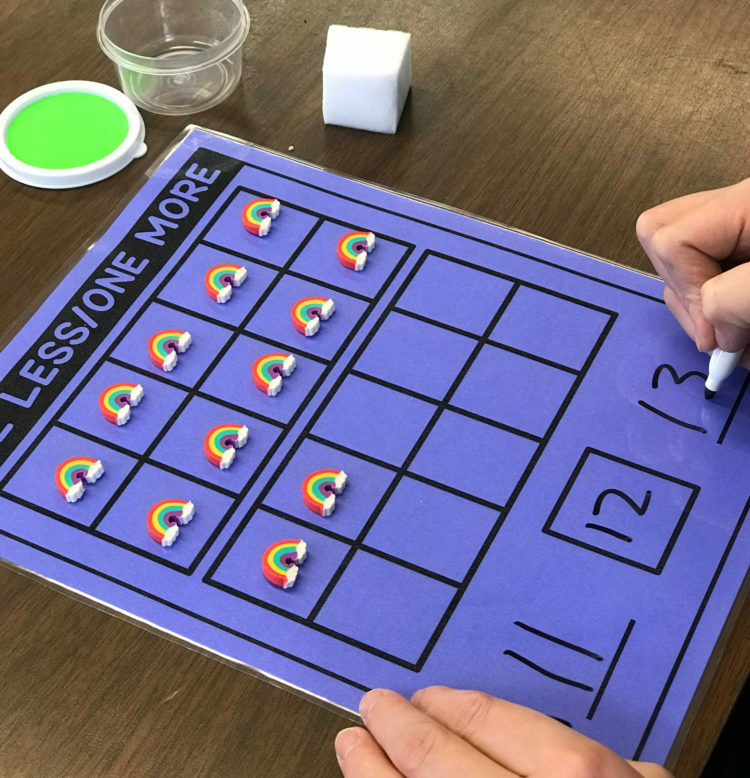 We have rest in my class, but I always give my students the option to do work on the skills they need to practice if they prefer. 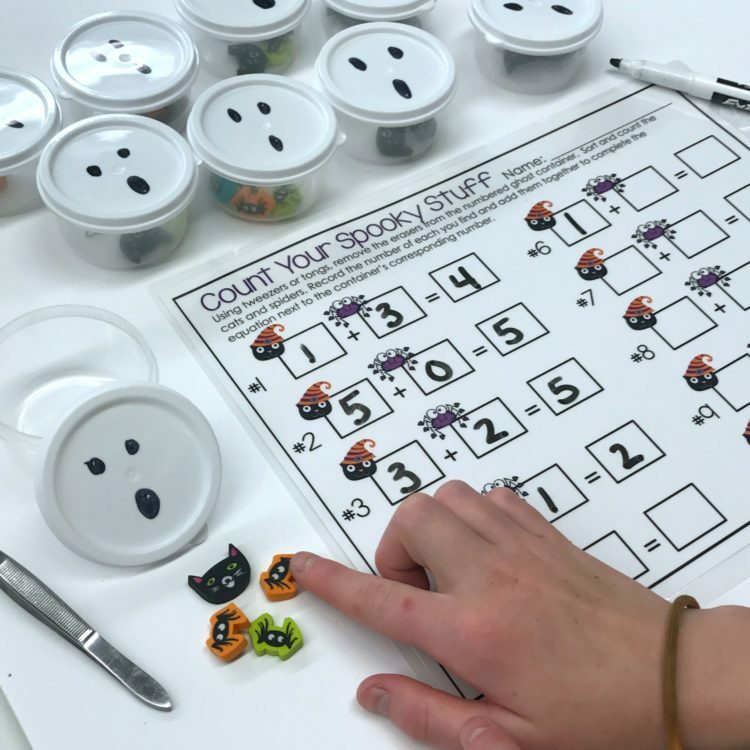 Math cups are a great way to do that, and I’m always ok with that. The more practice I can give them, the more confident they become . . . The first thing you’re going to wonder is . . . well, what kind of cups do I need? I’m going to tell you straight up, it doesn’t matter. 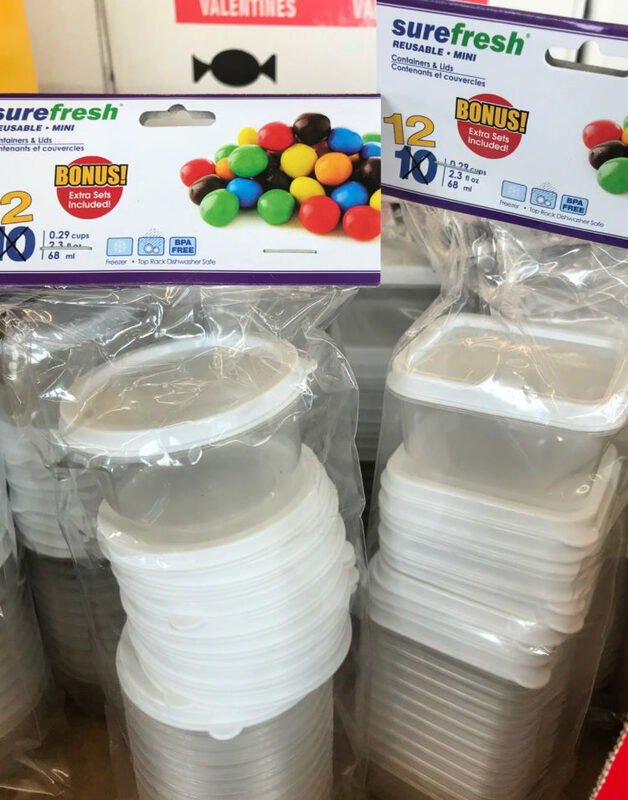 Get cups or containers that work for you . . . things you can afford . . . things that make sense for your students and that they can manage. I personally love these Dollar Tree round cups because they are dirt cheap and if I use my colored stickers, I can instantly differentiate them by color. It makes things so simple. 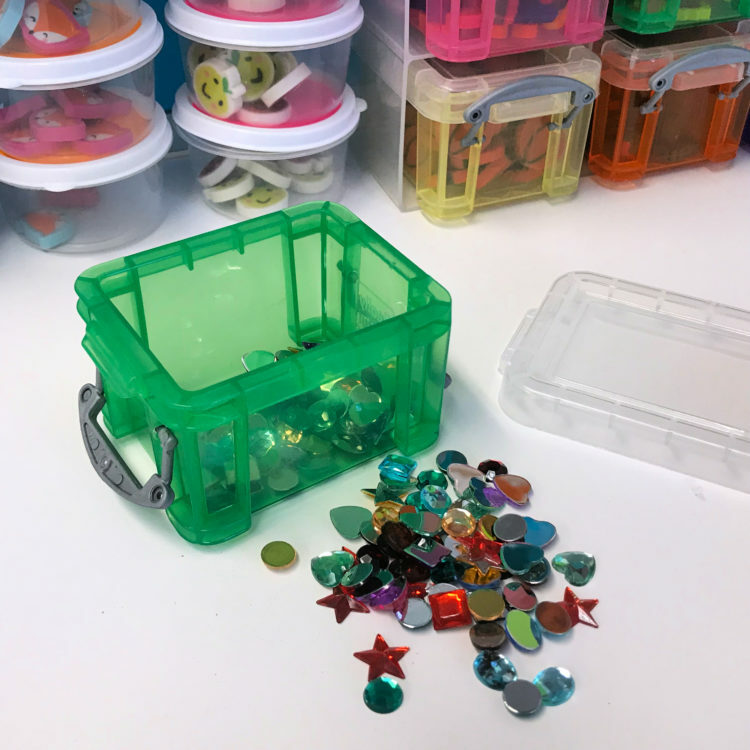 If you don’t have a Dollar Tree or if your Dollar Tree is out of these sweet little containers, you can order them from Dollar Tree by the case (36) and share them with your kindergarten team. They are available on Amazon, but they’re a little bit pricier. 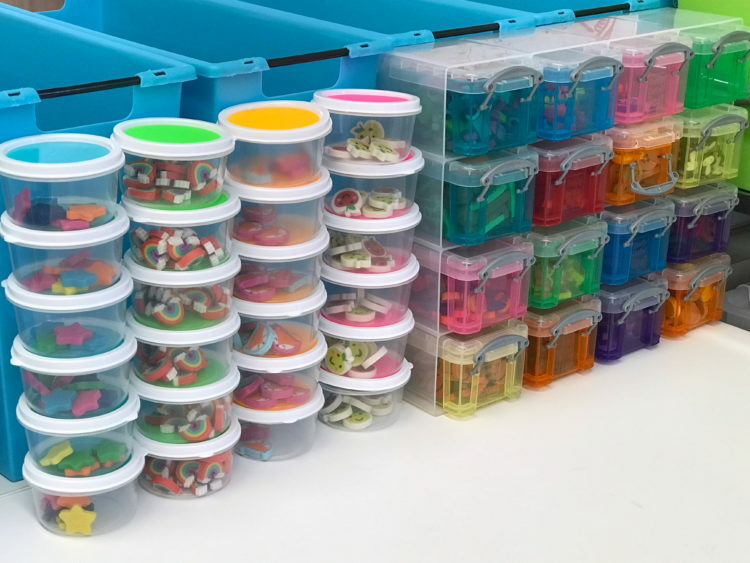 If items are larger, I found these clear boxes (they also come in a bunch of colors) from Walmart. Ultimately, whatever you find and that works for what you need them to do, will be fine. 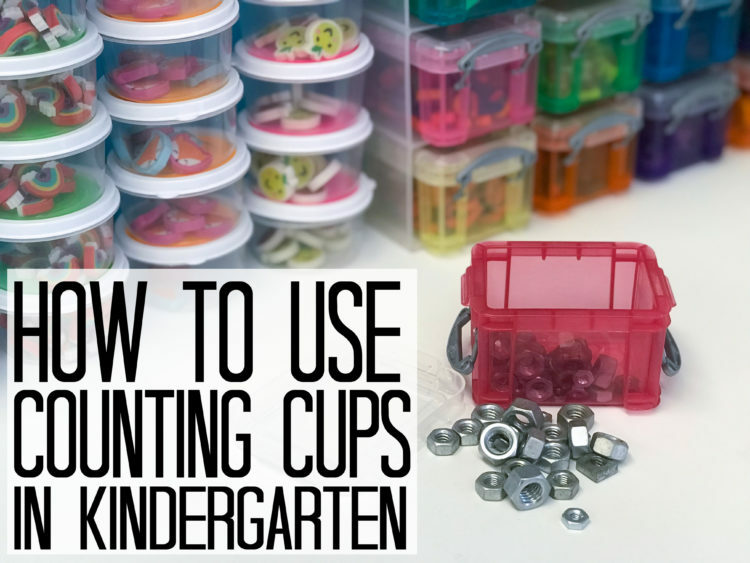 Where ever you keep your cups, they need to be within reach of your students. Place them on a low shelf that they can access without your help. In close proximity, you’re going to want to keep corresponding math mats. 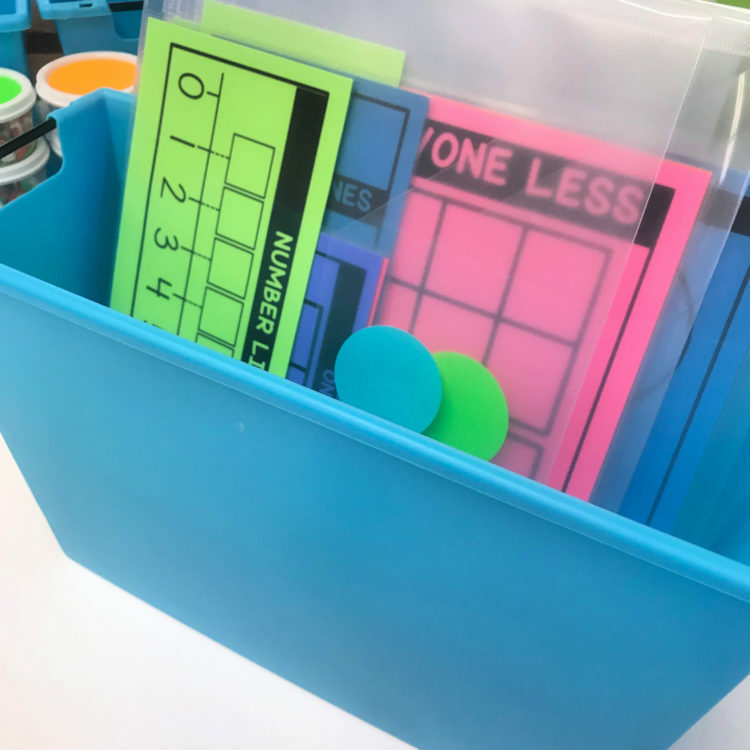 Now personally, I do not put math mats into their color-coordinated folders until I have introduced to them how to use them. They need to have practice using the materials correctly. 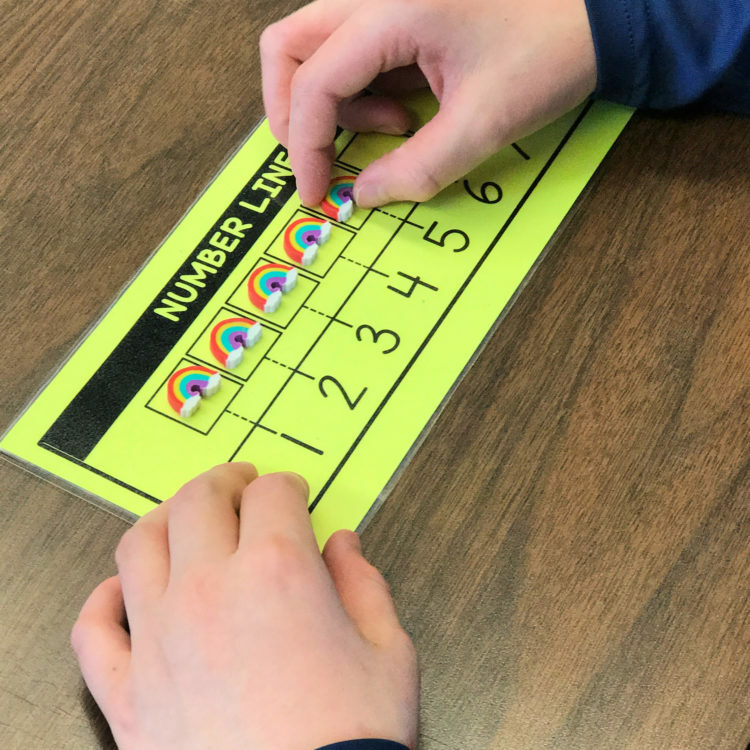 Usually, that comes when I pull students for small groups during math stations, but I can also introduce a simple mat like ‘number line’ during our whole group calendar math time as well. We practice, practice, practice . . . Practice how to select a cup, practice how to use the cups, practice how to open and close and clean up the cups . . . practice, practice, practice. Front-loading the ‘how-to’ will save you many, many headaches in the end. 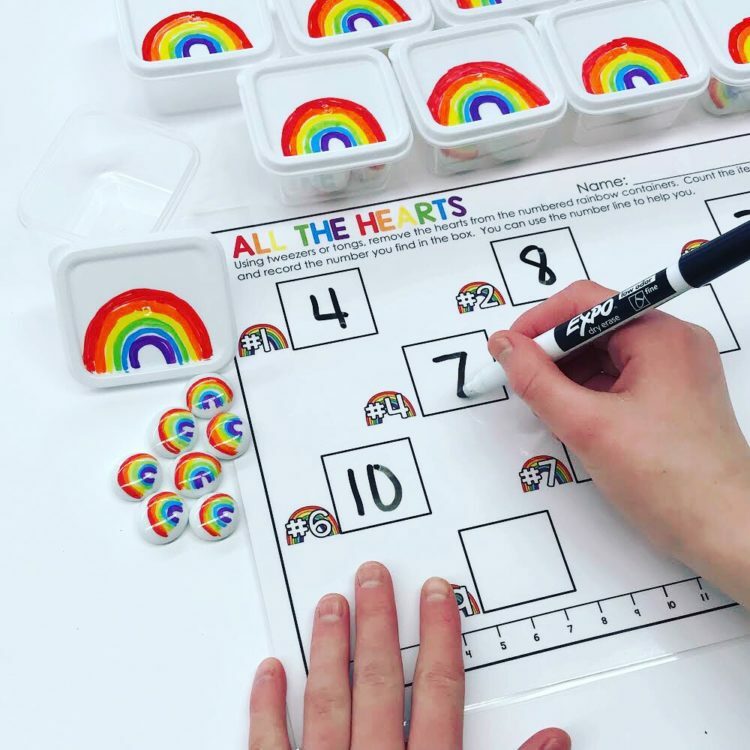 The color of the cup corresponds with activities and skills they will find in a poly envelope with the same colored dot sticker in a magazine box next to the boxes. They simply grab a cup and a poly envelope with the same colored dot sticker. There will also be times, however, that I may want them to work on a specific skill and I’ll direct them to use a different colored cup. Also, I have a class set of cups that allow them to count up to 100 items. So those cups are always an option. 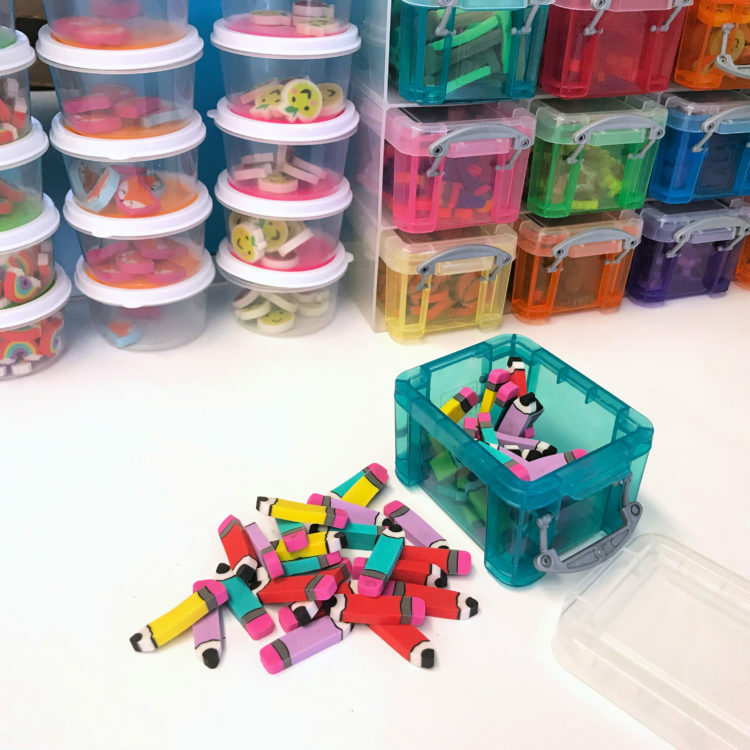 Yes, mini erasers are absolutely perfect and so so so cute, but ultimately, anything you use will work fine. I like to see what it is that engages my students. You could even ask them to bring things in to count. 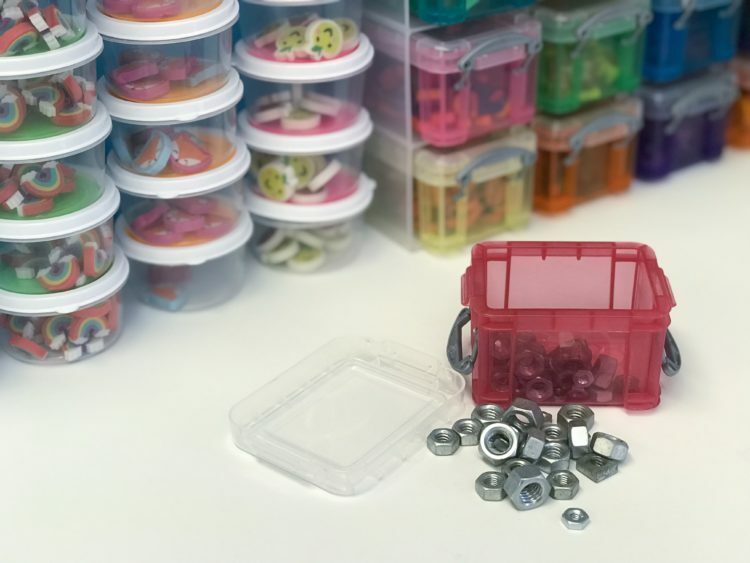 With a couple of different sized boxes, you should be able to accommodate almost any small thing from buttons . . . to keys . . . to even nuts! Get creative and have some fun with them. It doesn’t need to cost you an arm and a leg to get started. AND WHAT ABOUT THOSE MATH MATS I PROMISED . . . Yes, I have those for you. You can get the Google doc for free and it’s easy . . . BUT BEFORE YOU DO . . . right now before you do anything else, will you do something for me. 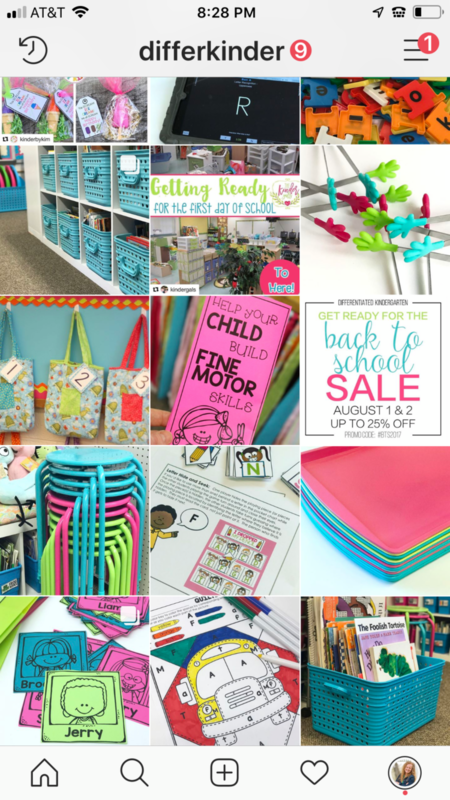 Please, if you like these free activities and ideas, follow me (@differkinder) on INSTAGRAM. Just click HERE or on the picture below. Ok now that you’ve done that–thanks so much. 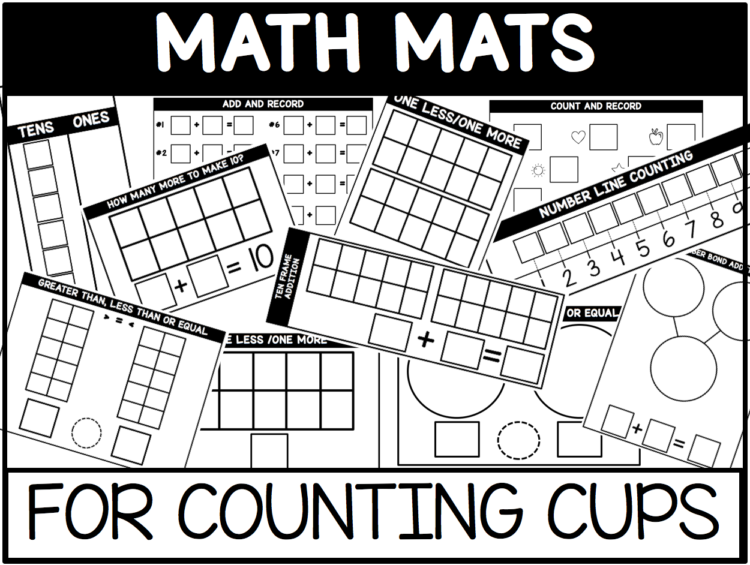 And here is your free set of math mats to use with your own counting cups. Just click the picture below and it will send you to the Google document. Download and save it to your computer.